With the JR300BT Kids Wireless On-Ear Headphones from JBL, kids can feel just as cool as the big kids, while parents can enjoy some well-deserved peace and quiet. Designed specifically for children, these colorful headphones have been engineered to always output audio below 85 dB, which will protect their hearing even at maximum volume. The JR300BT headphones wirelessly connect via Bluetooth to their mobile devices, such as a smartphone or tablet. The built-in rechargeable battery delivers up to 12 hours of playback, and you can use the quick charge feature to give yourself up to 1 hour of additional life with just 10 minutes of charging time. To help ensure your children will enjoy wearing their headphones for extended periods of time, such as during long trips to grandma's house, JBL has incorporated soft cushions on the headband and both earcups. The built-in controls on the earcup feature kid-friendly buttons that make it easy for children to operate their headphones all by themselves. The JR300BT headphones have four different size adjustments that have their own markings on the headband. Each size is depicted with 1-4 musical notes, making it easier for kids to resize them back to their favorite setting after sharing with friends. 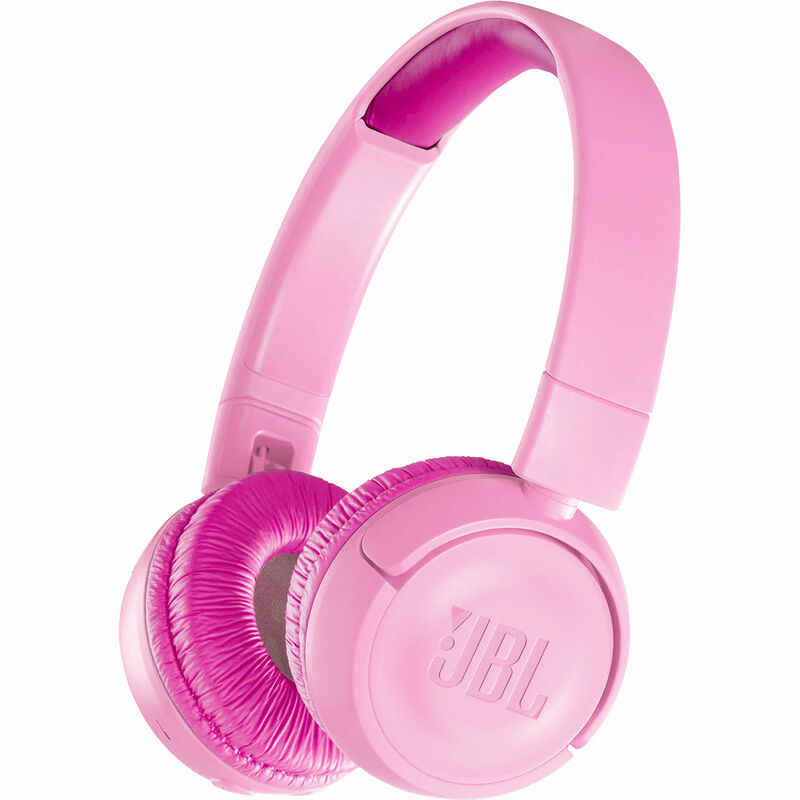 The JBL headphones' Bluetooth support can wirelessly transfer audio from up to 49.2' away. The earcups of the JR300BT wireless headphones fold in to make it easier for kids to throw them into a backpack. The JR300BT headphones come with a set of stickers, so kids can personalize their headphones to make them their own. Box Dimensions (LxWxH) 9.5 x 9.0 x 7.9"
JR300BT Kids Wireless On-Ear Headphones (Punky Pink) is rated 4.7 out of 5 by 74.